Starting my day off with tears of happiness. I love you my friend who is more like family! I will post a message on the blog as soon as I can! I know what you mean! Have a wonderful day! Oh yes! Your book is a big hit with the little ones! Give it time. It will grow bigger! What a sweet picture and writing about Bubby! We love being grammas, there is nothing better! 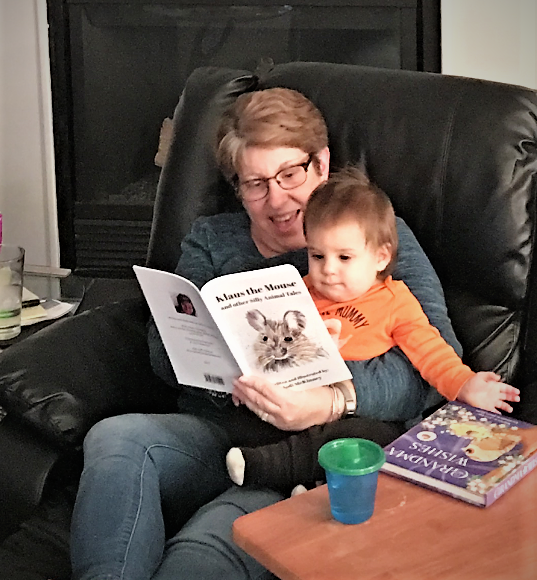 A lovely pic Jodi – your book certainly seems to be very popular with the little ones…. Beautiful thoughts of a BFF and her darling Grandson! Klaus and friends are spreading joy all over. Benjamin was so excited with the photo of “the baby and my Jodi’s book”! This lovely post brings these words to mind that I was given right after Benjamin was born : Grandchildren fill a place in your heart you never knew was empty. Thank-you for sharing. P.S. I would tell you why Benjamin now calls you “My Jodi”, but it is a long story (and sweet)! Oh those words are soooo true! I think we need to create a word that describes the joy of being a grandma, because one does not exist yet! ❤ And Oh My Sweet, Dear Benjamin – I have all the time in the world for the long story of how I became honored as his "My Jodi!" ❤ Melts my heart!!! Lovely! Just like your book!